Here's a lovely anecdotal story about my childhood. Growing up my grandparents on my dad's side of the family lived in Minnesota. We would see them a few times a year - typically around Christmas time and then during the summers. In fact, every summer for a few years my grandma and grandpa would take all of their grandchildren (there were nine of us) up to their house on Kimble Lake. They called it Cousins Camp. Swimming. Tubing. Horseback Riding. Water Parks. Bonfires. S'mores. Games. Canteen. We had it all. Another very important fact about my grandparents that helped shape the man I am today...they loved ice cream. And not just a little dinky one-scoop amount of ice cream. We are talking double the volume of the serving container. There was no such thing as too much. So here I am, many years later, still very much in love with ice cream. Let's think about this for a second - sure, there are many flavors of ice cream - vanilla, chocolate, strawberry, Moose Tracks, chocolate chip cookie dough, sea salt caramel - but for the most part, those flavors are to be expected. Are they not? In my 28-years of life, I can't say that I have stumbled upon many ice cream flavors that truly surprise me. That is until I was on a date a few weeks back at Ramen-san in Chicago. Green tea ice cream. Normal. Black sesame ice cream. Norm.....wait, what!? That's right, I for the first time in my life tried black sesame ice cream and it was shockingly delicious. I do not know what I was expecting. Something nutty? Something um.....I don't know? How do you even describe the flavor of black sesame seeds? I quickly stored this idea in my mental "Try for Smak" list. And a few weeks later, here it is. 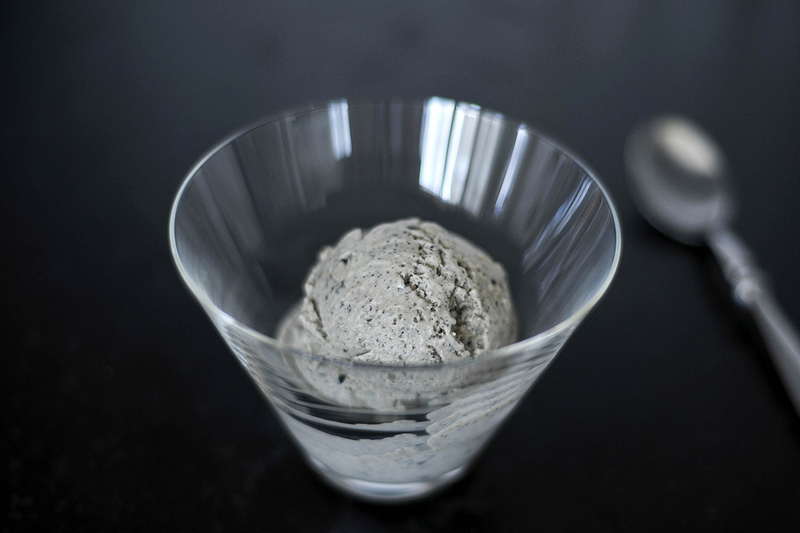 Homemade black sesame ice cream. Delicious. Different. Experimental. All of the things that I am not sure I was expecting from an ice cream flavor, but absolutely things that I do not regret. Try it. I dare you. Go eat some black ice cream! In a medium mixing bowl, whisk together egg yolks, sea salt, 2 tablespoons honey, vanilla, sugar, sesame paste and reserved whole sesame seeds. 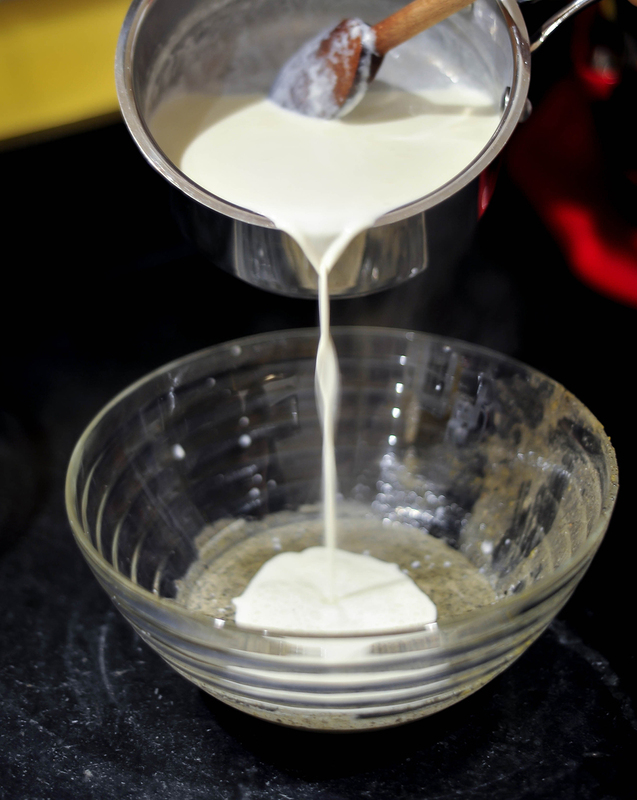 Put mixture back onto stove top over medium-medium high heat until the custard reached 175 degrees. Then, remove from heat and add to a mixing bowl. I will often add the bowl to an ice bath to cool it down quicker, or you can let the mixture come to room temperature. Chill in the fridge for 4-6 hours or until well-chilled. Add to an ice cream maker and churn for 25 minutes. Add to a baking dish or loaf pan covered with foil and chill two hours for the best texture. Serve with another sprinkle of black sesame seeds and flaky sea salt.